Yesterday there was another Netrunner tournament! 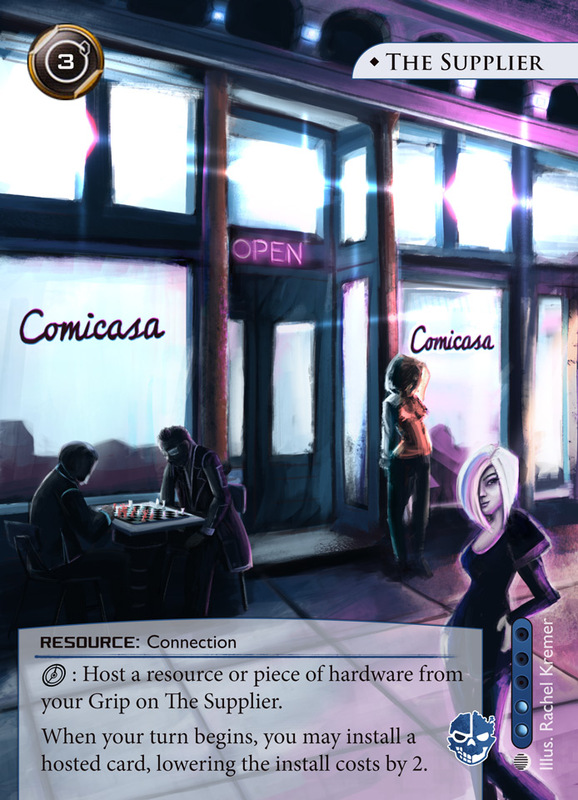 I was asked a few months back if I’d like to design a custom Netrunner card of The Supplier, displaying our FLGS Comicasa as a sort of thank you for the store and as a cool little price for all the participants. Of course I said yes and it was ‘released’ yesterday. The owners of the store got a very nice large print to hang at the wall and I received a lot copies of the card. We’ve been interviewed by DadMostlyLoses and it was published last week! You can read it by clicking here. What do you think is a great gateway game to get people interested in board games? Another gateway game I’d recommend is Ticket to Ride or Pandemic. small world is a fantastical rich world thats to small for all the races. a bit difrent art style then your usual take, nice. and the netrunner card, thats just plain cool!!. altogh i stil have to try netrunner (shame). I’ve had success with The Adventurers games from Fantasy Flight (Temple of Chac and Pyramid of Horus). The Indiana Jones-esque theme informs all the potentially daunting action mechanics, and it’s great to see those friends that have never played an RPG really get into their character. Tokaido is a game I’ve had massive success with, so much so that when I guilted my family into playing, they not only tolerated it, they asked to play it again!